If I were Trump, I would fear Midwestern Sens. Amy Klobuchar and Sherrod Brown. Either would be well positioned to take back blue-collar states Trump needs, like Wisconsin, Michigan, Pennsylvania and maybe even Ohio and Iowa. They could also play well in the Sunbelt suburbs of Arizona, Florida and North Carolina. A few weeks ago, the pollsters at Monmouth University asked Democrats across the country to choose between two different kinds of nominees. One was a candidate whom the voter agreed with on most issues but who might struggle to beat President Donald Trump. The other was the reverse — a strong candidate with different views from those of the person being polled. I think there are two main reasons for the switch. The first, of course, is the awfulness of the Trump presidency. But the less obvious reason is important too: The differences among most of the leading Democratic presidential candidates just aren’t very big right now. They all favor policies to lift incomes and reduce living costs for the middle class and poor. They all favor tax increases on the rich. They all favor climate action, voting rights and expanded Medicare. Most voters understand that choosing a candidate with modestly different ideas about how to achieve these goals isn’t much of a sacrifice. So if Democrats wanted to identify their best hope for beating Trump, what would that candidate look like? Above all, it would be a candidate good at persuading Americans that he or she was on their side — on their side against the forces causing the stagnation of American living standards. More specifically, this candidate would be someone who could convince swing voters of this allegiance. Swing voters still exist. Enough Americans switched from backing Barack Obama in 2012 to Donald Trump in 2016 to House Democrats in 2018 to help decide those elections. I understand why some Democratic activists are instead drawn to the idea of victory through turnout: It offers the promise of avoiding any political compromise. The problem is, there are virtually no examples of Democrats winning close races without emphasizing persuasion. The 2018 attempts, in Florida, Georgia and Texas, all fell short. Yet progressives shouldn’t despair — because swing voters are quite progressive, especially on economic issues. For years, we’ve been hearing about a kind of fantasy swing voter, conjured by political pundits and corporate chieftains, who is socially liberal and economically conservative (as many pundits and chieftains are). The actual swing voter leans decidedly left on economics, in favor of tax increases on the rich, opposed to Medicare cuts and skeptical of big business. Still, these swing voters don’t think of themselves as radical. They are typically patriotic and religious. Many think of themselves as moderate and, strange as it may sound, many thought of Trump as moderate in 2016. When Republicans can paint a Democrat as an out-of-touch elitist — like they did Hillary Clinton, John Kerry, Al Gore or Michael Dukakis — the Republican candidate often wins these voters. When Democrats can instead come off as middle-class fighters, they tend to win. In the 2020 field, two Democrats have the strongest track record of running as middle-class fighters: Amy Klobuchar and Sherrod Brown. They are both Midwestern senators, Klobuchar (who launched her campaign Sunday) from Minnesota, Brown (who hasn’t yet decided whether to run) from Ohio. They both have a populist folksiness to them. And, no, those aren’t racial code words. Obama also won swing voters thanks in part to populist folksiness. About the power of large corporations, Klobuchar has said, “The public is at a breaking point.” She talks constantly about lowering health care costs. 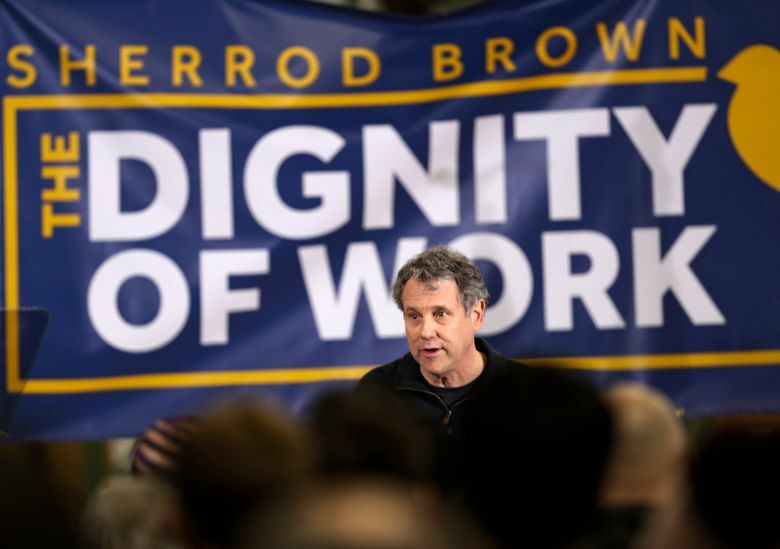 Brown talks constantly about restoring “the dignity of work.” Both have also smartly avoided some ideas that play better with liberal Twitter than swing voters, like the fever dream of eliminating private health insurance. Klobuchar and Brown do have weaknesses. She is battling accusations of having been a harsh boss, which seem to be a mix of sexist stereotype and some truth. Brown, as a middle-age white guy not known for rhetorical greatness, will have to show he isn’t too boring to stand out in a crowded field. But if I were Trump, I would fear Klobuchar and Brown. Either would be well positioned to take back blue-collar states Trump needs, like Wisconsin, Michigan, Pennsylvania and maybe even Ohio and Iowa. They could also play well in the Sunbelt suburbs of Arizona, Florida and North Carolina. And if I were the other 2020 Democrats, I’d be studying how Klobuchar and Brown have succeeded where so many other Democrats have been failing. David Leonhardt is a regular columnist for The New York Times.